Preferred Habitat: Hybrid striped bass have habitat preferences intermediate to their parents. Hybrids prefer clear open waters, but can withstand far warmer conditions than striped bass. Consequently, hybrids can be successfully stocked in smaller bodies of water that become warmer in the summer than most reservoirs. Food Habits: The hybrid consumes primarily soft-rayed fish species like threadfin shad, gizzard shad, and blueback herring, but will consume other fish and insect species as opportunity allows. Spawning: Hybrids are created under laboratory conditions. The most common cross is between the male white bass and a female striped bass (Palmetto bass). However, sometimes the reciprocal cross is made between the male striped bass and the female white bass (Sunshine bass). 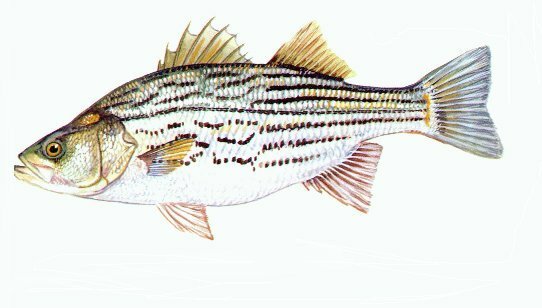 Mature hybrids have viable gonads and will migrate upstream with white bass and striped bass during their seasonal spawning run. There is strong evidence that they also will occasionally spawn with these pure adults creating intergrades between pure species, which are highly undesirable. For this reason, hybrid stocking is restricted to only a few Savannah River Drainages.